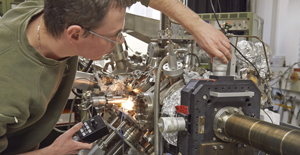 The largest detector ever built based on the GEM technology was assembled in the past few weeks by a group of scientists led by Prof. Laura Fabbietti from the Physik-Department of Technische Universität München (TUM). 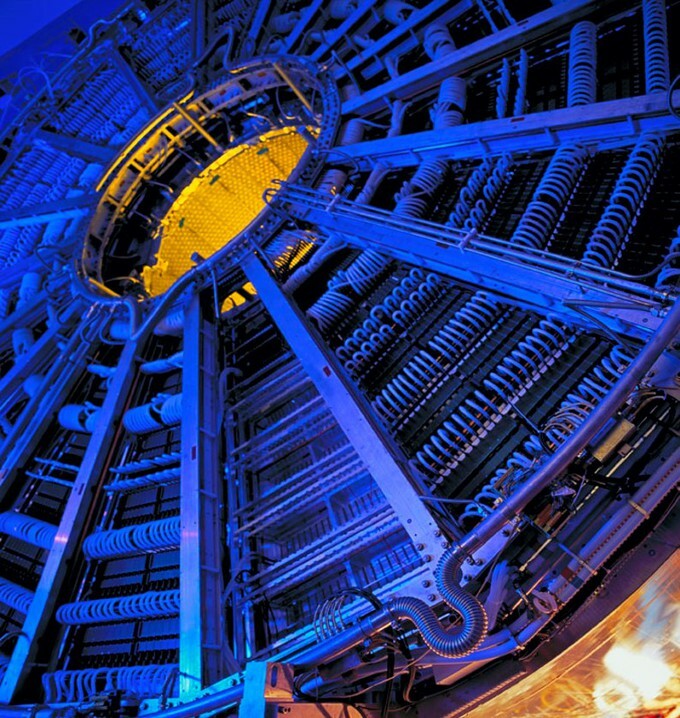 As part of a six-week project at the TUM and at CERN, 40 physicists, engineers and technicians from eleven institutes worldwide built the world’s largest prototype of this detector technology, the first sector of the outer readout chamber (OROC) for the Time Projection Chamber at the ALICE experiment at CERN. 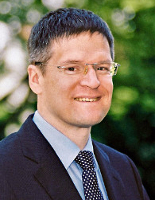 The workshop named “School of ROC” was initiated by Dr. Piotr Gasik from the group of Prof. Fabbietti, who is coordinating the assembly of the ROCs. In the coming months, a further 35 detector elements will be mounted and tested at the participating institutes. After the next big upgrade at the Large Hadron Collider (LHC) at CERN, these new ROCs will be implemented at the ALICE experiment, replacing the technology presently used in the Time Projection Chamber. The world’s largest Time Projection Chamber (TPC) is the main component of the experiment ALICE at CERN; in display are the segments of one of the two Outer Readout Chambers. The world’s largest Time Projection Chamber (TPC) is the main component of the experiment ALICE at CERN, which records the tracks and the speed of fast charged particles. These particles are formed when lead ions collide with almost speed of light. Only at this emerging extreme temperatures and particle densities, the strong nuclear force can be overcome so that the protons and neutrons of the lead nuclei “melt” to a plasma of “free” quarks and gluons for a short period of time. After diverging and cooling, several thousand particles such as electrons, photons or pions emerge. Workshop “School of ROC” at the Physics Department: The first detector segment for the new Outer Readout Chamber (OROC) for the ALICE experiment at CERN is assembled; it is the largest detector ever built based on the GEM technology. But the present MWPC readout chamber (Multi Wire Proportional Chamber) of the TPC will no longer meet the increasing requirements soon: From 2019, the LHC will deliver ion beams whose lead ion bundles will collide with a rate of 50,000 times per second (50 kHz ), which is about a factor of 100 above the present read out rate of the TPC. However, in order to prove the existence of a quark gluon plasma, it is crucial to characterize all of the resulting particles created in such a collision. Therefore, the increased luminosity can only be exploited by significantly increasing the readout rate of the TPC. It is foreseen to replace the existing MWPC-based readout chambers by Gas Electron Multiplier (GEM) detectors to overcome the rate limitations imposed by the present gated readout scheme. In order to meet the challenging requirements of the upcoming detector upgrade, an extensive research and development program lead by the research group of Prof. Laura Fabbietti at TUM is underway. A first milestone has now been reached in April 2015: the prototype of the 36 detector elements for use in the ALICE experiment has been assembled. With an active GEM detector area of 0.68 square meters, this is the largest GEM detector ever built. The prototype for the Outer Readout Chamber (OROC) was commissioned in the framework of the workshop “School of Roc”. 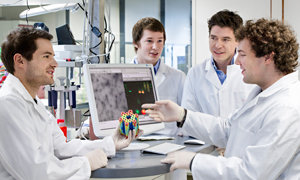 It took place from 8 March to 17 April 2015, conducted in cooperation with the Central Technology Laboratory (ZTL) under the direction of Dr. Roman Gernhäuser (TUM). 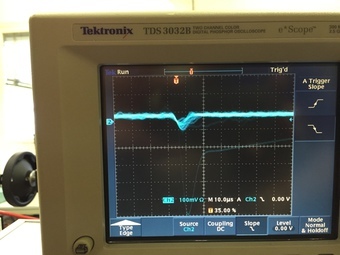 The oscilloscope’s signal indicates that the GEM detector successfully works since the test signal is amplified as expected. 40 physicists, engineers and technicians from eleven institutes from Germany, Switzerland, Romania, Hungary, USA and Brazil met at the Physics Department of the TUM and at CERN. The participants tested and mounted twelve GEM foils for the external readout chamber, coordinated by Dr. Piotr Gasik, scientist in the group of Prof. Laura Fabbietti. The foils were then assembled at CERN in four layers to form a three-segmented prototype of an external readout chamber. First tests were successful. The overall active readout detector area sums up to 34 square meters, for which a total of 137 square meters of GEM foil will be needed, with nearly a total of 4 billion holes of micrometer size etched into it. With the experience gained at the workshop, the participants will be mounting and testing the remaining 35 detector-segments within the coming months. 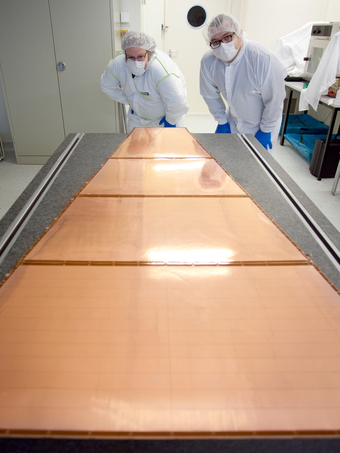 The new GEM detector is planned to replace the present technology after the LHC upgrade in 2019.